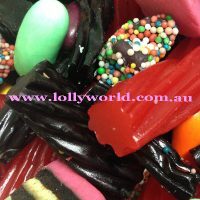 Licorice Mix is for licorice lovers who can’t decide what to have. this mix gives you a variety of choice. This random mix will be made up of Black Cats, Licorice Allsorts and also Black Licorice Twists. Red Licorice Twists, Candy Bullets, Sparkles and Black Jelly Beans.